Privately owned within 137 hectares of nature reserve on the Knysna River, the Phantom Forest offers a unique bio-diversity of Afromontane forest, Cape coastal fynbos and estuarine wetland. 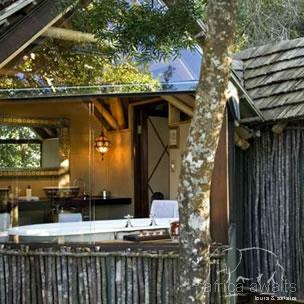 Nestling in the forest, with endless views shared only with the Fish Eagles, the large and elevated luxury 'tree suites' are an African celebration of natural textures from silky Swazi cotton sheets to hand-woven coir carpets, and from stunning end-glass gables to the sensuous forest bathroom. 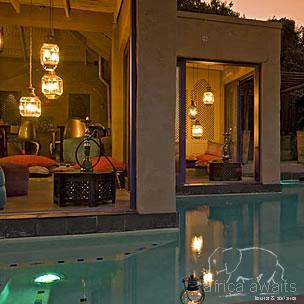 Experience the evocative sounds, scents and tastes of Africa... at their very best! On arrival at the Gatehouse - you will be met by 'Bush-Butler' Wilfred, who speaks 7 languages! You will then be transferred to the bush vehicle - and the Phantom adventure begins! A fairly new addition is the ‘Body Boma’, an exciting stress release centre in perfect synergy with the Phantom Forest Nature Concept, nestling in the forest edge with evocative views over the lagoon and river estuary. One of the favourite massage techniques. An holistic, soothing, rhythmic massage, with the added therapeutic benefit of essential oils. Tones and relieves stiff muscles ~ a great destresser. Designed for specific soft tissue damage and sports injuries and certain chronic conditions; incorporates acupressure and shiatsu for pain relief. A technique designed to stimulate lymph flow, can be beneficial in treatment of cellulite and general fluid retention. Most effective when used in conjunction with Aromatherapy. A hand and foot treatment which helps stimulate the body’s own healing mechanisms and is a useful aid in preventative health care. draws from a combination of the above techniques and is customized to suit your particular needs. Please discuss this with your therapist and receive a unique treatment designed specifically for you. helps your body regain its natural balance through a holistic hands-on healing process which works on all levels of being ~ body, mind and spirit. This treatment aims to re-energize and re-align. * A private jetty where there are canoes moored ~ take the canoes out for the afternoon and request a light picnic basket to enjoy along the banks of the lagoon! * Indigenous forest walk (an approx. 45 min -1 hr walk through the indigenous Knysna forest on the premises). Take a packed picnic lunch along and stop at one of the secluded picnic spots in the forest! 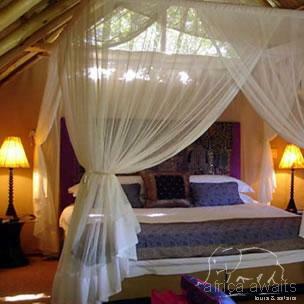 With your holiday, safari or business trip from in to Phantom Forest Eco Reserve in The Garden Route.